Above Photo: Workers at Avant walked off the job. During the past month, between 30,000 and 40,000 of the 70,000 maquiladora workers in Matamoros plants have walked off their jobs. The maquiladoras are factories, mostly foreign-owned, that manufacture goods destined for sale in the United States. They are the product of a development policy begun by the Mexican government in 1964, allowing the construction of foreign-owned plants, so long as their products were sold outside Mexico. The attraction for foreign companies has been a wage level far below that of workers just a few miles north, and the lax enforcement of environmental and worker protection laws. As a result, along the border today, more than two million workers labour in these factories. 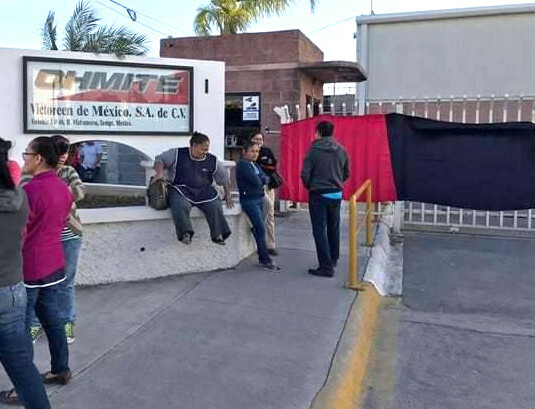 In Matamoros, however, factory owners declared that the wages of their workers would not increase because they were already making what López Obrador had ordered. According to Juan Villafuerte Morales, general secretary of the Union for Workers in the Maquiladora Industry, the workers were earning between 156 and 177 pesos per day. Villafuerte’s union is affiliated with the Confederation of Mexican Workers (CTM), which, during the past 25 years of the North American Free Trade Agreement (NAFTA), has been a labour partner of the pro-corporate Mexican governments that preceded López Obrador’s. On the border especially it has acted as a labour enforcer for the government policy of using low wages to attract foreign investment in maquiladoras. Many older Matamoros workers remember a pre-NAFTA era when their wages were much higher and the CTM union was run by a different kind of leader, Agapito González Cavazos. From the late 1950s to the late 1980s, the period in which the maquiladora industry mushroomed, the Matamoros maquiladora union had 50,000 to 60,000 members. In the 1970s, when the national minimum wage was 140 pesos (then worth $11.20), in Matamoros it was 198 pesos ($15.84). In 1983, González negotiated a famous agreement with a 43 per cent salary increase, and an arrangement in which workers were paid for 56 hours of labour, but only worked a 40-hour week. In the NAFTA era that followed, labour opposition was weakened and wages fell drastically. In 1992, workers were demanding $19.50 per day. The new minimum wage, even after being doubled by López Obrador, is $9.27. The workweek has gone back up from 40 hours to 48 hours in most factories. Making matters worse, while Matamoros’s maquiladora wages aren’t the lowest in Mexico, the cost of living on the border is much higher than in the rest of the country. The price of many basic necessities, like milk, is actually higher in supermarkets in Mexican border cities like Matamoros and Tijuana than it is just across the line in Brownsville and San Diego. A woman on the assembly line in Tijuana has to labour for half a day to earn enough to buy a gallon of milk. Prices have been rising rapidly in Matamoros, according to the Tamaulipas office of Mexico’s Federal Consumer Affairs Prosecutor. A pound of serrano chiles now costs 55 pesos, more than half a day’s wage at 88 pesos. The price of tomatoes has gone up by 20 per cent and onions by 26 per cent. Soon work stopped in many plants, including Polytech 1, Polytech 2, Dura 4, AFX Autoliv, and Cedras de México. A large percentage of the striking workers came from factories producing auto parts for U.S. assembly plants. AFX, for instance, is a supplier to General Motors. According to the Matamoros Maquiladora Association, companies lost $100-million in the first ten days. Thousands of workers marched through the streets of Matamoros. On January 18, the workers – 2,000 strong – occupied the offices of their own union, which Villafuerte had closed, fearing the strikes and demonstrations. Angry workers accused him of caving to company demands, especially in a new contract being negotiated for 2019. One of their chants (which rhymes in Spanish) was “The people are tired of so many damned tricks!” Workers organized their own independent network, called the Workers Movement of Matamoros. Villafuerte was forced to announce that the union would mount an official strike. The workers’ basic demandwas a 20 per cent increase in pay, and an increase in the productivity bonus from 3,500 pesos yearly to 32,000 pesos. Some factories offered a 10 per cent wage increase, and a 10,000-peso bonus, but workers rejected it. On January 24, they began walking out at the 45 factories covered by the union agreement. According to La Jornada ’s Le Duc, “in some factories it was a violent process, because the managers ordered the security guards to block the doors to prevent workers from leaving the production lines.” Workers also tried to blockade the doors into some plants themselves, suspecting that managers might try to sneak out machinery to continue production elsewhere. Rolando Gonzalez Barron, a leader of the employers’ association, called the workers “ignorant” and threatened to fire them if they participated in strike actions. Nevertheless, on January 24 – the very first day that workers walked out – four factories agreed to the workers’ demands. Over the past week more than 20 more have given in, thereby getting their workers to return to the assembly lines. The anger directed by workers at the CTM may have far-reaching consequences. Last year, before López Obrador took office, the previous government was forced to ratify Convention 98 of the International Labour Organization, guaranteeing freedom of association. The Mexican Congress then passed a constitutional reform, embodying these changes, including the right of workers to vote on contracts, elect their own leaders, and form unions of their choice – practices that the government and its cooperating unions did not previously recognize. Sweetheart agreements, called “protection contracts” because they protect the employer from any effort by workers to form independent unions and raise wages, will no longer be legal. In Matamoros, one result of the strikes and organizing may be a decision by workers to use the labour law reforms and leave the CTM. Other national independent unions may also challenge the CTM. The miners’ union has been active in organizing on the border, and has supported the Matamoros workers, although it has no union contracts in the city. When the strikes started, the State labour board said that it had no jurisdiction over the Matamoros conflict, because it fell under Federal purview instead. But on January 29, it declared the strike “non-existent” in 16 factories. Such a declaration allows a struck company to bring in strikebreakers and fire striking workers. However, another feature of the new government’s labour law reform is the replacement of the labour boards, which have historically defended employers, with a neutral system of labour tribunals. The actions of the labour board in Matamoros provide strong evidence supporting the need for this change. Following the labour board’s announcement, Tridonex fired 600 workers, with the support of the CTM. In protest of the firings, a former union leader, Leocadio Mendoza Reyes, began a hunger strike in the city’s downtown plaza. “These people were fired because they asked for wage increases, and the head of the union – who’s my brother – turned his back on them,” he told La Jornada . Despite the firings and repression, workers have succeeded in winning significant wage increases in a number of factories. Of the original 47 that workers struck, companies agreed to the workers’ demands in all but 11, and strikers returned to work following those agreements. The strike has spread to three other plants, Toyoda Gosei, Fisher Dinamic, and Robert Shown, where workers rejected an 8 per cent raise negotiated by another CTM union. Nearly 1,000 other workers at the non-maquiladora facilities of Coca-Cola and Matamoros’s main milk distributor, Leche Vaquita, also walked off their jobs, demanding the same 20 per cent raise and an end to unpaid overtime.